How do you feel when you look up at a clear, starry night sky? Does the dazzling sparkling spectacle bring up feelings of awe, reverence or wonder? Or does the vast expanse of dark nothingness incite a sense of eeriness, vulnerability or humility? If you’re like most people, you probably experience a combination of these. Since the first caveman has set foot on the planet, humans have been trying to decipher their relationship with the omnipotent and higher powers that presides over us all. Pagan and tribal sects venerated Mother Earth and devoted a lot of energy towards nurturing their connection to her, because they believed that their fate was directly connected to whims of the natural world. As beliefs began institutionalizing, began seeking psychological support in established religions. People were especially needy of the security that religion offered because they lived in a world where they were continually subject to the dangers of death, torture and oppression. We have come a long way since then. People have developed more confidence in their own capabilities, their governments and their communities. We now live in more stable and predictable times – we feel more in control of our destinies and less fearful of any external contingencies that could overthrow our life. Still, there are times when we’re reminded that we’re vulnerable, especially when we hear tragic stories of innocent people being hurt or killed in unexpected events such as natural disasters, automobile and airplane accidents, or something as jarring as wars or terrorist attacks. These events wake us up to the unpredictability of life. All we can is manage our odds. Now I don’t mean to paint a depressing picture of doom and gloom here. The point that I’m trying to emphasize is that we can’t always rely on an rational thinking and expect a predictable sequence of events to occur. During our decision-making process, it’s critical that we account for that mysterious, unknowable variable that cannot be explained by logic, because it’s beyond the grasp of our human comprehension. Fate and destiny play a significant role in everyone’s experience and it’s vital that we acknowledge these mysterious forces. 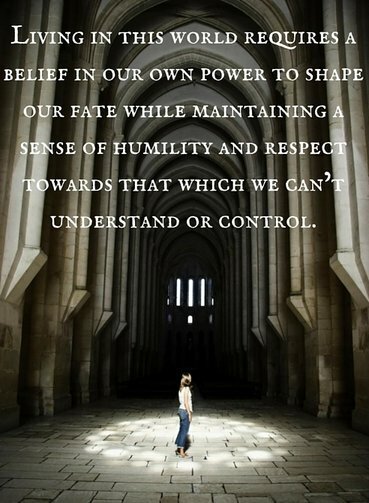 Living in this world requires a belief in our own power to shape our fate while maintaining a sense of humility and respect towards what we can’t understand or control. Some people find sustenance through their religious beliefs and practices. I certainly believe that all religions offer a treasure trove of wisdom and insight on how we can develop faith in the unknown. For those of us who prefer more pragmatic approaches, we can get comfortable with uncertainty by having an open attitude and maintaining a flexible attitude when dealing with unpredictable influences. While it’s up to maximize our chances for our success, there will always come a point when we simply have to let go of our control over a situation and surrender it to the cosmic forces of the universe. This is where having faith becomes essential in the process of manifesting our dreams. In addition to following religious doctrines, there are several other effective ways by which we can keep our faith afloat. We can find hope in inspiring stories, books and movies. It can also be found in creative activities, and following a regular spiritual practice that is customized to our preferences. 1. It gives us hope and a purpose to live: Having faith in the possibilities to achieve an extraordinary life is what will spur us on to pursue our ambitions. We find purpose and meaning in our struggles, convinced that we will eventually come out on top as winners. We feel alive and connected to a sense of purpose because we know for sure that better things are in store for us. There’s a sense of positive anticipation about the future. 3. It increases our chances of manifesting what we want: When we have positive expectations regarding favorable outcomes in the future, we are more likely to manifest our desires. From a strategic point of view, we will feel more motivated to take action and stick with it. Metaphysically, we tap into the magic-like forces of the Law of Attraction that’ll eventually bring our dreams to fruition. 4. We can become a source of courage and support for others: When we work on fortifying our belief in the unknown, we simultaneously increase our capacity to be a pillar of strength for everyone else around us. When others lose faith, we can be their rock by providing them with the wisdom and love that they need to restore their hope in the promise of a better, brighter and more beautiful tomorrow. I’ve always believed that the experience of flying on a plane is the perfect metaphor for having faith. Whenever you step onto a plane, you believe in the mechanical efficiency of the plane and the pilot’s skills in safely maneuvering it to your desired destination. We also have to be prepared for any bumps and turbulence along the way, knowing that as long we have faith, we can be sure that our temporary abode in the skies will stay on course. Until then, we can sit back, relax and enjoy the majestic views on the way to our destination. Question for you: What are some steps that you’re willing to take to have faith in the unknown? My question would be what do you do when your faith is weak and no matter how much you now you should have faith you just cant seem to muster it? A.J that is when you need faith the most. You have to build practices and rituals that maintain your faith. For some it religious based for others it’s not. What has helped you in the past- speaking with friends? Reading or writing? I think it is very personal to each one of us. I hope you find a way that works best for you! I’ve always gotten strength from my friends but lately there is no here standing with me, it literally feels like I am walking through this with only my husband beside me. 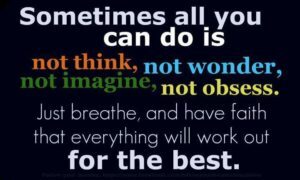 So that has to be enough and is what will get us through but it truly is hard when we are doing it on your own. You’ve managed a first class post. I’d like some advice on how to write like you.